With the potential for more beach renourishment projects to come in over budget in the future, the Sarasota County Commission wants to eliminate any chance that it could be accused of favoritism in dealing with funding requests from municipalities, Commissioner Charles Hines pointed out in a recent advisory board meeting. Therefore, the commission next week will be asked to approve advertisement of a public hearing to modify its Tourist Development Tax (TDT) ordinance to create smoother transfers of money from one TDT account to another in responses to figurative cries for help from cities dealing with more costly contracts to replenish eroding beachfronts. 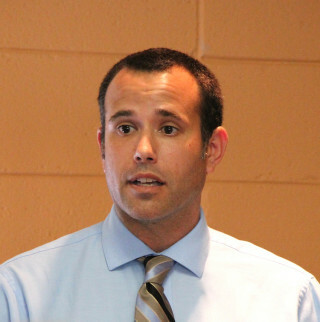 A staff request to advertise the public hearing will be on the agenda for the Feb. 9 meeting in Venice, Matt Osterhoudt, senior manager in the county’s Planning and Development Services Department, told members of the Tourist Development Council (TDC) during their Jan. 21 session. Assuming the commissioners approve the request, Osterhoudt added, the hearing tentatively has been set for March 8. A staff memo prepared for the TDC members explains that a portion of TDT Fund 186 “is dedicated solely to beach nourishment, restoration, and erosion control,” while Fund 103 “is less restrictive,” as it can be used for beach park maintenance and renourishment. The memo points out that both the City of Sarasota and the City of Venice use Fund 103 for their beach nourishment initiatives, as the county maintains their beaches. Conversely, the memo adds, the county takes money from that fund to pay for its beach park maintenance. 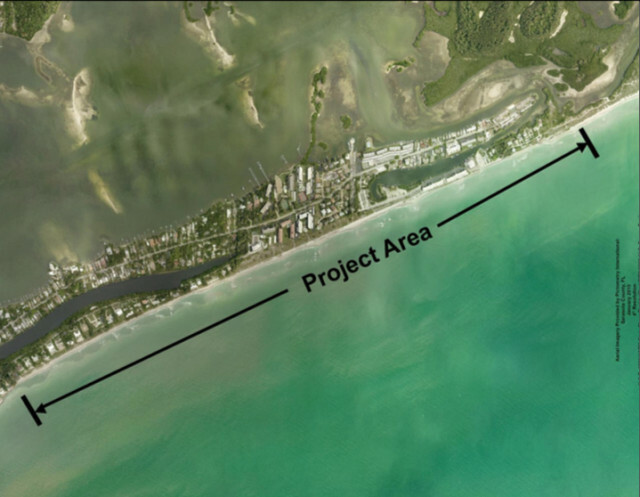 Fund 186 also has been the primary funding source for the county’s South Siesta Key nourishment projects, the memo continues. Since the county put together the first nourishment of South Siesta Key 12 years ago, the memo points out, the commission has approved three requests for money in Fund 186 to help municipalities with projects related to “unique events.” The first time, in 2007, the board gave the City of Venice $267,000 to help with “an unexpected additional permitting requirement” that was a result of a change in a state rule, the memo explains. The second was in 2014, when the City of Sarasota received close to $1 million, the memo notes, to supplement its emergency project on Lido Beach to stabilize shoreline that was significantly eroded when Tropical Storm Debby whirled offshore for several days in June 2012. The third was in 2015, when the commission granted the City of Venice $1 million to supplement that city’s regular renourishment funds because the budget for its latest project proved higher than anticipated, the memo says. On March 31, 2015, the County Commission asked County Administrator Tom Harmer to direct staff to re-examine policies in the TDT ordinance associated with Fund 186, the memo explains. In response, on June 15, 2015, the memo continues, staff provided a report to the board explaining how the ordinance as written gives the commission “the ability to consider requests for funding on a case-by-case basis.” However, as a follow-up effort, staff compiled another report — delivered on July 10, 2015 — identifying how a potential amendment to the TDT ordinance could help the board in making such case-by-case determinations, the memo notes. However, further tweaking of the language makes it clear that the county’s funding needs for planned projects “will be considered” prior to the granting of such municipal requests. Osterhoudt explained that the TDC did not need to take any action on the proposed ordinance change. He just wanted to give the board members an opportunity to offer their comments. Earlier in the TDC meeting, Doreen Buonpastore, a fiscal consultant in the county’s Office of Financial Management, presented slides showing details about the use of TDT revenue during the 2015 fiscal year, which ended on Sept. 30, 2015. 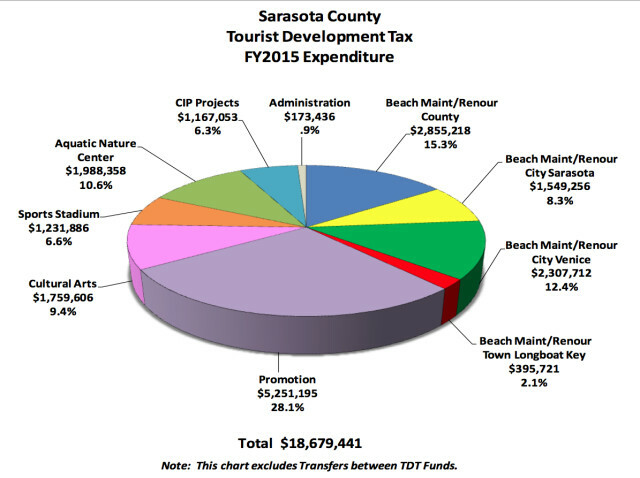 A pie chart reflecting expenditures of the money showed the City of Sarasota receiving $1,549,256 for beach maintenance and renourishment — 8.3 percent of the total TDT expenditures of $18,679,441 — and the City of Venice receiving $2,307,712, or 12.4 percent, for its renourishment project. Altogether, the TDT revenue for the last fiscal year was $19,073,635, a county record, Sarasota County Tax Collector Office records show. The Town of Longboat Key also received beach renourishment money for a project in FY2015: $395,721, or 2.1 percent of the total TDT expenditures for that fiscal year. Buonpastore pointed out to the TDC members that the county will use about $9 million in TDT revenue for its second South Siesta Renourishment Project, which is set to begin soon. The total cost of that project is about $21.5 million — almost double the original estimate for it, Laird Wreford, the county’s coastal resources manager, has pointed out. In response to a question from The Sarasota News Leader, Paul Semenec, the county’s project manager for the South Siesta undertaking, explained in a Feb. 4 email that he issued the Notice to Proceed to Weeks Marine of Covington, LA, on Dec. 22, 2015, with the contract period having begun on Jan. 2. 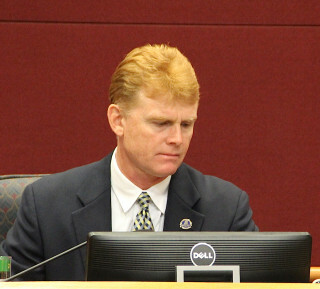 The county has allowed 120 days for the work to reach the “substantial completion” stage, he added, which is April 30. “The initial construction schedule submitted to me by Weeks Marine has mobilization of equipment and material beginning in mid-February, with a start date of March 1, 2016 for dredging and sand placement,” Semenec wrote. “Weeks Marine, Humiston & Moore (engineer of record), and this office have since early January been working through a myriad of pre-construction requirements,” Semenec pointed out. “I held a pre-construction meeting on January 27th with the contractor, engineer of record, and staff from Sarasota County Environmental Permitting, [U.S.] Army Corps of Engineers, Florida Department of Environmental Protection, Florida Fish & Wildlife Conservation Commission, [U.S.] Fish & Wildlife Service, and Mote Marine,” he noted.